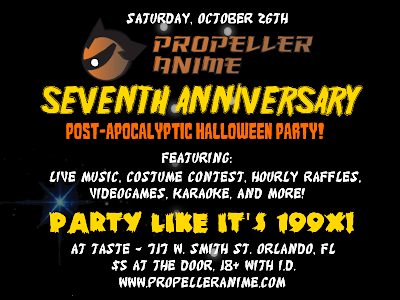 Propeller Anime: Propeller Anime's 7th Anniversary Post-Apocalyptic Anniversary Party! 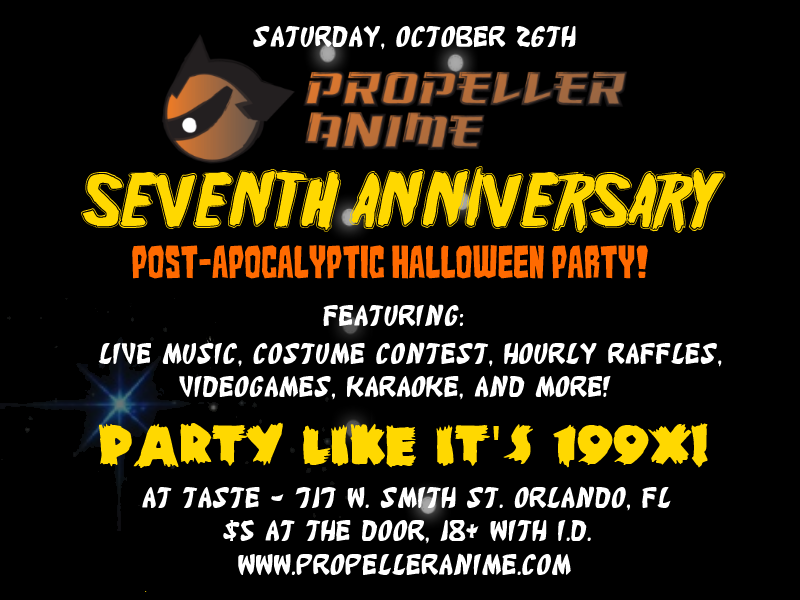 Our 7th Anniversary Post-Apocalyptic Halloween Party will be on Saturday, October 26th at Taste, located at 717 W. Smith St. Orlando FL. (Same place as last year!) Party starts at 8pm! For those who haven't been before, Taste has a full bar and tapas restaurant, along with live performance space and plenty of room to party! It's very close to downtown Orlando and even I-4. At our party, we'll have live music, karaoke, a costume contest, hourly prize raffles, videogames, tabletop gaming and more! When we get together, we have epic fun and this will be a celebration of our friendships and the great times we've had over the past year! If you want to help out with any aspect of our party, whether it be bringing games and/or equipment, running tournaments, entertainment, prize donations, or sponsorships: please contact us via e-mail at propelleranime[at]gmail.com and we'll work to make sure you are involved officially at our anniversary party and make it worth your while to do so! "We know Halloween is coming up, what's the deal with the Post-Apocalypse??" you ask. Well, the same week that Propeller Anime turns 7 is also the same week of that Hokuto no Ken(known here as club favorite Fist of the North Star) began serialization in Weekly Shonen Jump 30 years ago! Not only that, its hero Kenshiro has SEVEN scars on his chest! It makes total sense! That means we'll party like it's 199X! Bring your post-apocalyptic gear because in addition to "Best in Show" for our costume contest, we'll have a "Most Likely to Survive in 199X!" award to give out! We'll be accepting entries for traditional and post-apocalyptic takes on your favorite anime, manga, and video game characters! We'll be launching a donation drive for Propeller Anime that will be a crowdfund campaign that will launch next week. The drive will cover a couple of big events this year(including this party! ), upgrading our monthly Anime Nite Orlando to high-definition, and all the other expenses we'll have in order to do a better job for the anime community here! If you pledge a certain amount to the drive, you'll get in to this party for FREE! Otherwise admission is $5 at the door which is a pretty sweet deal! Over the next month and a half, we'll be announcing entertainment, prizes, sponsors, contest details, and more for our 7th Anniversary Post-Apocalyptic Halloween Party on this website, our podcast, and social media outlets so check back to see what we have going on! Don't forget to RSVP to our event on Facebook!